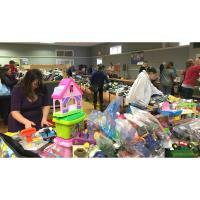 (Dover NH – April 2, 2018) - On Saturday, April 7, 9am-3pm and Sunday April 8, 10am-1pm the Children’s Museum of NH will once again offer its semi-annual Consignment Sale. The sale is a huge children's clothing and gear sale held at the Hellenic Center, 219 Long Hill Road in Dover, NH. For families who shop during the Saturday, April 7th sale, they will automatically be entered to win 4 admission tickets into the Children’s Museum of New Hampshire. Please note that the consignment sale is not held at the Children’s Museum, has no admission fee, and that parents are strongly encouraged to leave their children at home during this event, due to the large crowds. This spring sale is generously sponsored by Northeast Credit Union. For more information, please visit www.childrens-museum.org.